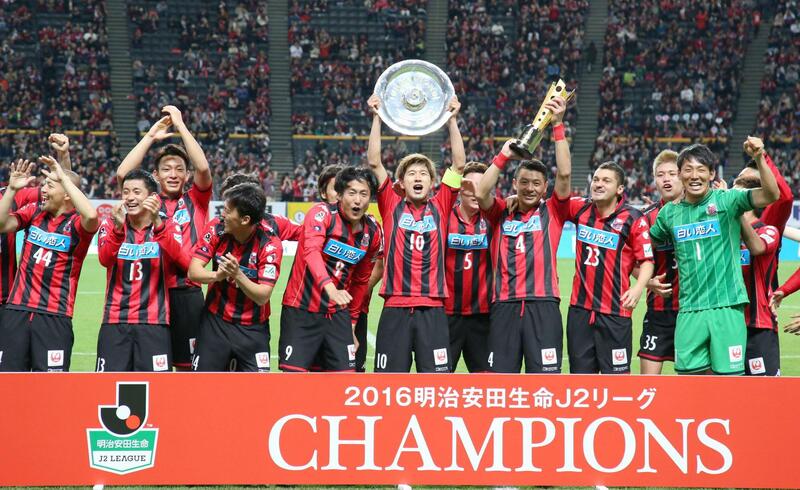 Consadole Sapporo and Shimizu S-Pulse finished one-two in the J. League second division, clinching promotion back to the top flight on Sunday. Consadole’s 0-0 home draw to Zweigen Kanazawa was enough to keep them on top of the table with 85 points from the 42 games. Sapporo will return to the first division after a five-year absence. 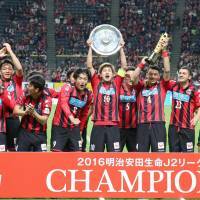 Consadole were congratulated by a member of their Hokkaido-based baseball counterparts, the Japan Series champion Hokkaido Nippon Ham Fighters. “I’m thrilled that two Hokkaido professional sports teams have been able to have a fantastic season in the same year,” Fighters ace Shohei Otani said. S-Pulse finished one point behind, beating Tokushima Vortis 2-1 away for their ninth consecutive win and sealing their J1 return after just one season in J2. Shimizu’s Shinji Kobayashi became the first manager to promote four teams, having led Oita Trinita from J2 in 2002, Montedio Yamagata in 2008 and Tokushima in 2013. Matsumoto Yamaga narrowly missed out on automatic promotion, ending up third on goal difference despite a 3-2 victory at home over Yokohama FC. Yamaga will head to the four-team promotion playoffs starting Nov. 27, when they will face sixth-place Fagiano Okayama. Fourth-place Cerezo Osaka play fifth-place Kyoto Sanga in the other match. The winners of the two games square off Dec. 4 for the remaining ticket to the first division.